Germany (Würzburg); Early 14th Century. Latin Text; Gothic Script; Transitional Early Gothic Notation. The Missal has been for many centuries one of the most important liturgical books of the Roman Catholic Church. It contains all the directions, in rubrics and texts, necessary for the performance of the mass throughout the year. The text frequently varied considerably according to locality. 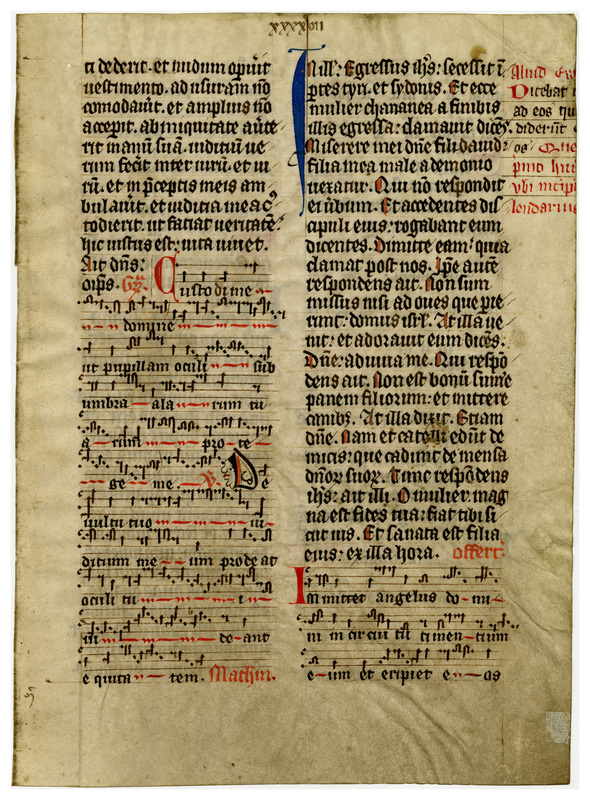 This particular manuscript was written by Benedictine monks for the Parochial School of St. John the Baptist in Würzburg shortly after 1300 A.D. The musical notation is the rare type which is a transition between the early neumes and the later Gothic or horseshoe nail notation. The "C" line of the staff is indicated by that letter, and the "F" simply by a diamond, an unusual method. The bold initial letters in red and blue are "built up" letters; first the outlines were made with a quill and then afterward the areas were colored with a brush. 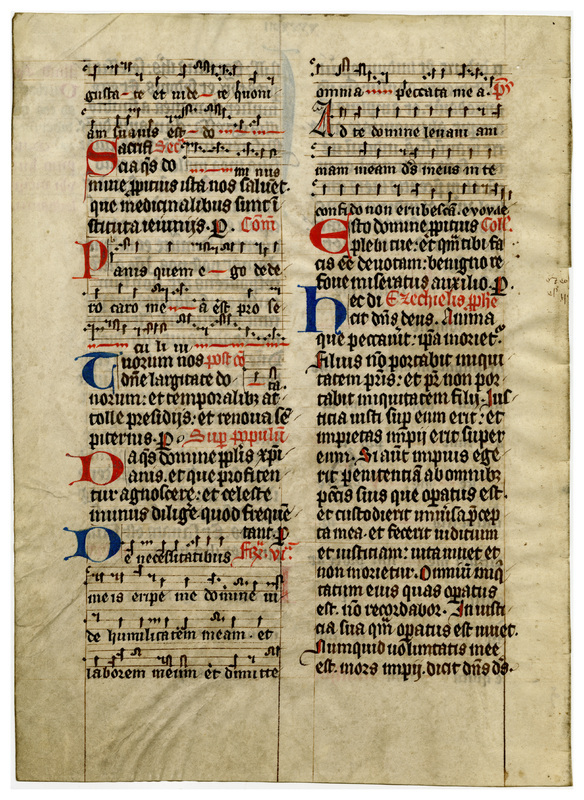 The vellum is supple and well-worn, and has darkened to a grayish tone. The text remains dark black, and there is an interesting variety of shades of red in the decoration and rubrication. Where the text contains Biblical passages the first letter of each verse is pricked in red. The page has been cropped, resulting in the loss of some marginal text, and folio numbering in Roman numerals in the upper margin may have been added after the cropping. “E0022 Leaf from a Missal (Missale Herbipolense),” Digital Exhibits | Denison University Archives & Special Collections, accessed April 23, 2019, http://exhibits.denisonarchives.org/items/show/44.